Game Developers Conference (GDC) is the annual event “to inform and educate game industry professionals on online multiplayer games, mobile and next generation game technologies”. After its world trip to Mobile World Congress with Intel in Barcelona and to CeBIT in Hanover, Rover arrived back home in San Francisco to show the interested crowds in or around Intel’s booth our vision of smart, next generation technologies for both – work and play. Below please see for yourself Rover’s impressions of GDC. Rover makes new friends at GDC. Rover gets his own Intel Internet TV interview. Rover – what a camera magnet! Rover makes new friends everywhere. …and gets stopped by curious spectators. CeBIT is the world’s largest annual IT fair in Hanover, Germany. Being my first CeBIT, I was happy to bring something to show. Once again Rover impressed me, how easily he drew peoples’ attention – young or old, IT pro or consumer. We had plenty of contact with the press, were interviewed by MobileGeeks’ Nicole Scott at Intel’s Bloghütte (watch interview here), by Region Hannover TV, and another european TV station. We talked with authors and editors of several print magazines and made incredibly helpful new friends at Microsoft and SAP. But see for yourself our week at CeBIT 2014 in pictures below. MobileGeeks’ Nicole Scott interviews Martin Wojtczyk about Rover – a smart and sensing LEGO self-driving car. What a week! Rover and I happily presented every single day at Mobile World Congress 2014 in Barcelona and traveled between both locations: WIPJam at Fira Montjuïc next to the beautiful Magic Fountain, and App Planet at Fira Gran Via – the spacious, new conference center. No matter if on Intel’s GeekBench, during the Intel Innovators Panel, on exhibit at App Planet, or on the carpet – Rover was always surrounded by an amazed crowd of people. See yourself in the picture album below. Thank you, Intel and developer relations team, for giving me plenty of opportunities to present and network! Rover at Mobile World Congress gets interviews and attracts crowds of people. 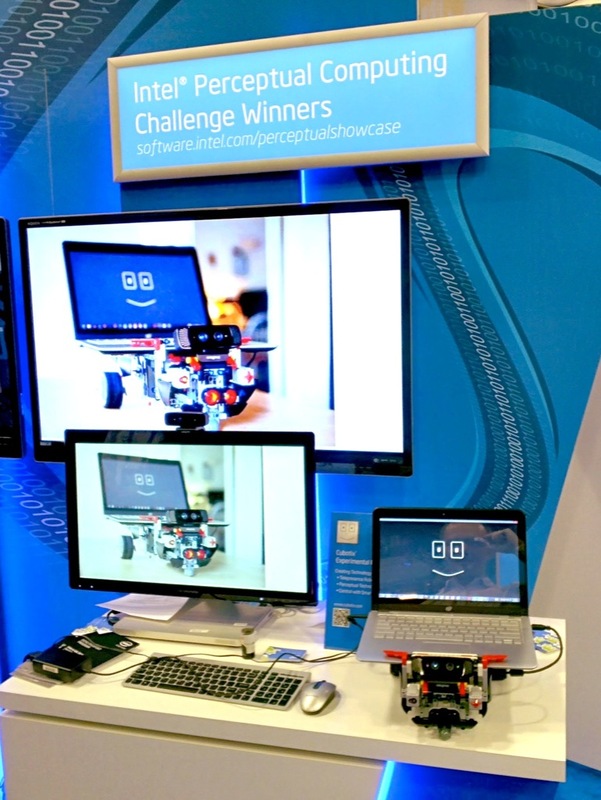 Rover during a demo at Intel’s WIPJam IoT Hackathon at Mobile World Congress. Rover at Mobile World Congress attracting crowds of people. Rover at Mobile World Congress attracting crowd of people. Suit up! Men in black and Rover at Mobile World Congress. Rover at Mobile World Congress made a friend with cool glasses. Rover befriends Intel Android at Mobile World Congress. Rover charging up and looking awesome on a table at Mobile World Congress. The folks from the famous Cyanogen mod checking out Rover at Mobile World Congress. Rover gets an interview from Nicole Scott of MobileGeeks. Rover making friends at Mobile World Congress. Intel has generously invited us to showcase our award-winning autonomous intelligent sensing robot at Mobile World Congress in Barcelona. Join us for a presentation in the session: “Innovator Talks: Emerging Tech from the Intel Developer Community” on Monday 3pm – 4pm in Hall M5 at Fira Montjuic, Room 6 – Level 3 (see also: http://sched.co/1gnrrKR). For a brief overview of the platform you can check out the video below and our contest entry for the Intel Perceptual Computing Challenge 2013. Rover is an interactive, autonomous mobile robot platform, capable of exploring and mapping unknown environments. 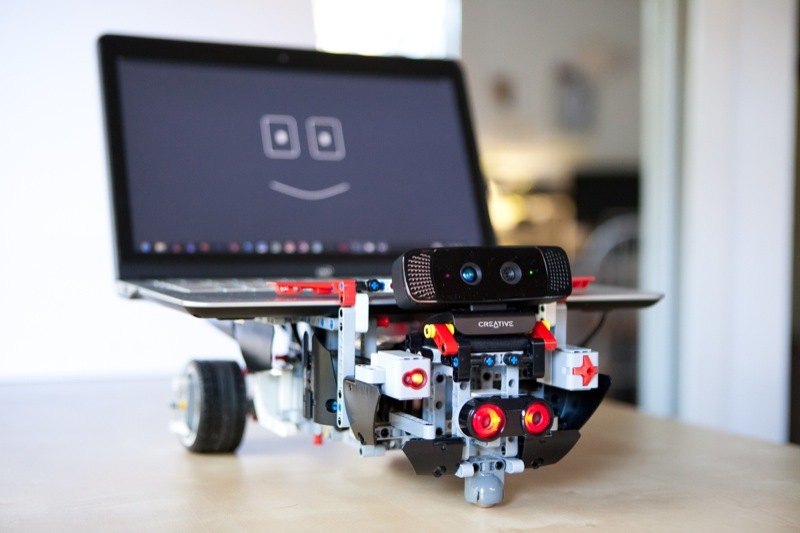 The platform consists of a LEGO EV3 motorized base, a Core i7 laptop for its compute power and the Intel Interactive Gesture camera with a depth sensor. Utilizing the depth-camera, the platform is able to sense its environment and navigate autonomously and collision-free in unknown surroundings like a self-driving car. Furthermore the robot detects people, recognizes voice and gestures and interacts via speech with the user in front of the robot. We appreciate this opportunity. Thank you, Intel!